Circle Boring excels at large part turning. 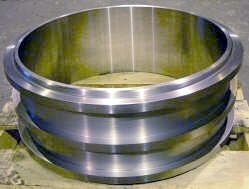 We have various gear manufacturers that rely on us to produce their gear blanks on a cost efficient basis. 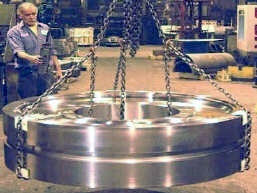 Our CNC vertical turret lathe can swing a 68" part with a 60" height. All of our VTL"s are full CNC to meet our customer's turning needs efficiently and economically. We have made major investments in our large part CNC turning capacity over the last three years to better serve our customers. The newest vertical turret lathe we installed has a side head allowing the machine to turn and bore simultaneously resulting in cost savings on your work-piece. Angles and contours can be generated on any of these machines. We turn a wide variety of rings for our customers. 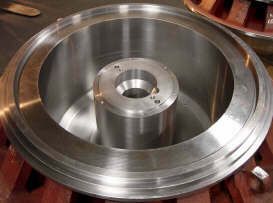 We can also do any secondary machining that your part may need. This capability can save you many dollars of extra machining and transportation costs. 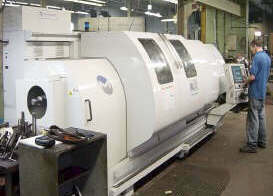 We can handle most any large part CNC turning requirements that you have.